Congratulations to Paul Waldock who wins £100. Phil Taylor Third Place £20. Here we go again, January nearest the pin challenge, the first of 6 golfing events this year. Again we have 3 shots for £5, but this time you can also have 5 goes for the price of 4 over the course of the event. So if you have two on one day and two on another, you can get another go free (you dont have to have all your goes on one day). Don't forget its the best two shots averaged. The competition starts on 3rd January and will last the whole of January, so people have 4 weeks to have a go. Second and Third prizes to be confirmed. There will still be the HOLE IN ONE PRIZE - which is a free hour on the simulator once a month for a year. And for three shots on the green, the one hour on a simulator at any time of your choice, providing its available of course. 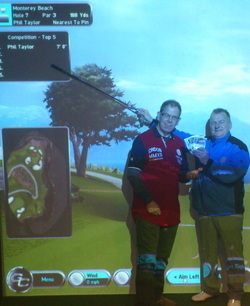 Can anybody beat Phil Taylors nearest the pin winning average of 7ft 2in back in December. You don't have to as its a new challenge. At the end of the year, we will have the 6 winners of the challenges (these wont always be nearest the pin), have a play off for a further prize. Please look out on these pages for the latest leaderboard.